So, one of my goals on my 22 Before 22 was to enter three writing competitions. I didn’t manage to enter any, but I have recently caught the creative writing bug again, so I decided to include the goal on my 23 Before 23 this year. The other day, I was really struggling with one of my literature essays, and everything was distracting me, but one of the things that distracted me was the Short Story Challenge 2014. This short story competition is unlike any other writing competition I have seen. It is broken down into rounds, and the competitors are split up into groups. The stories that are judged the best in each group move onto the next round. The most interesting part, however, is that the organisers email you three words that act as the basis of your story. These three words are a genre, a subject and a character, and you have to turn these into the story for the competition. The first round gives you 8 days to write and submit 2,500 words, the second gives you 3 days to write 2,000 words and the final round gives you 24 hours to write 1,500 words. I liked the concept of having a starting point and a close deadline for the competition, because otherwise I find it hard to focus on writing a competition entry when I have university work to do. The entry fee was pretty steep, but all entries receive feedback from the judges, and it will seem worth it if I make it to the second round…I’m keeping my fingers crossed! Since I am preparing for the competition to begin, and I am inspired to so some creative writing, I have revisited my creative writing supplies. I have picked out some of my favourite and most inspiring resources to share with you to get you writing too! We are all writers as bloggers, and whether you write fiction or not, these resources are sources of inspiration! 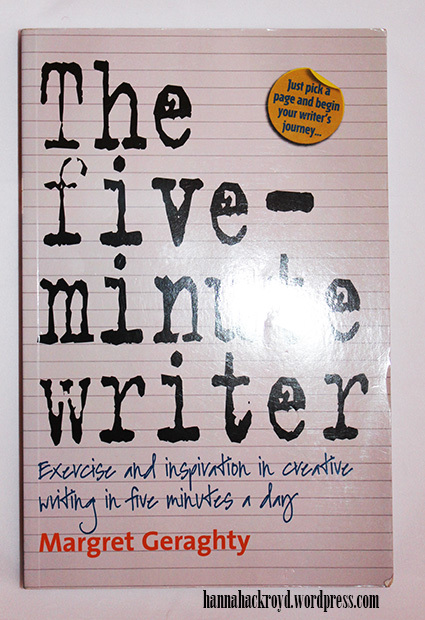 My first and foremost ‘go to’ book when I am looking for writing inspiration is The Five-Minute Writer by Margret Geraghty. This book is one that you can literally pick up and open at any page to get writing. This book contains 58 activities that have a brief introduction, then a five-minute exercise to write. With such brief exercises, it is easy to squeeze these activities into even the busiest of days! There is a range activities that are all diverse and inspiring. At the moment it feels as though every waking moment of my day is spent writing; last week saw me produce over 12,000 words of my novel, a few blog posts, two essays for university and an article for Karoo…phew! I feel like I am neglecting my blog slightly since I have taken on the NaNoWriMo challenge, so to make up for it, I am giving you a very quick update! As you know, I shared the opening scene of my first novel with you all a couple of weeks ago. I had been debating whether or not to share it on my blog for some time, but after the fantastic response I got, I wish I had done it sooner! It is still being viewed this long after I posted it and has had 246 views (which makes it my second most viewed post) in just this short space of time! Over summer, around taking part in all of my craftiness, I began planning and writing my first novel! (Exciting stuff but still a long way to go!) I have been debating sharing my opening with the world of blogging – my initial fears were to do with theft but I have done my copyright homework and know my rights so no pinching please! My second fear was criticism. Although I can’t do much about this, I am hoping that no one will be too harsh! I would definitely appreciate some constructive criticism as I know there are many established writers/bloggers out there whose advice I could definitely benefit from!